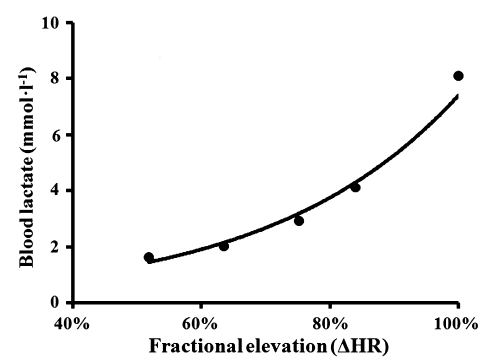 In this formula HRmin and HRmax, respectively, the minimum and maximum heart rate. The main problem in the practical use of the pulse method is the difficulty of the training continuously monitoring blood lactate level La(t) over a time interval training. To resolve this difficulty, still offers a variety of approximate models, depending on the blood lactate heart rate (lactate profile). So, originally developed Banister approach to the measurement of training load, based on average data for the population of athletes, in particular, the weightings reflecting thedependence of the concentration of lactate in the blood from the heart rate (Borresen and Michael Ian, 2009). The experimentally determined dependence of the individual blood lactate by heart rate is called individual lactate profile. Most current methods for calculating individualized TRIMP involves the construction of individual lactate profile in the course of a step test on a treadmill. The parameters a and b of this model are identified by the least squares method of measurements obtained by the step test on a treadmill. Individual lactate profile athlete is individualized mathematical model (result of parametric identification), that is, in a sense, a "physiological avatar". Implementation of the method of training impulse in technology "Physiological avatar" is based on a model of heart rate depending on the intensity of exercise. In this simple model, expressed exponential formula is replaced by a more complex and multi-factor model of the physiological systems of the body. Advanced features of sports training and in particular, the training load volume control using the monitor pulse training implemented in the client application PhA technology.